Deuces Wild is probably the 2nd most popular video poker game in the world, right behind the Jacks or Better game in popularity. Given the right payout chart, it can even have a positive expectation. 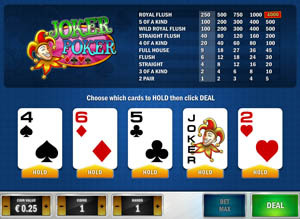 The version shown here is the Microgaming version of Deuces Wild which has a payback of 96.76%. Deuces Wild strategy charts are usually comprised of 5 different strategy charts, although one of them is a very short chart. These charts are divided by the number of deuces in your hand. If you have 4 deuces in your hand, there’s usually only one decision – what do you want to spend your winnings on? If you like Deuces Wild and would like to play for real money, please visit Guts.com. They’re the fine folks who made this free game available on our site.